We have only lived in our new build for a little over three years now and it has been completely transformed since the day we moved in. I am constantly redecorating rooms, styles and changing our home decor around. The spare room furniture has been moved in about a hundred different ways and combinations trying to capture the best lighting for my dressing table and still leave the room function-able and classy. I need a space to do my hair and makeup just like the rest of us and while in America we tend to always do this in our bathrooms, your bathrooms here are not equipped with sockets so dressing tables seem to be the common route to go. Although I can say the first two years living in England I did my hair and makeup in front of a body mirror leaning against a wall while sitting on the floor in front of it. I have had numerous dressing tables and the one below was a lovely present from my mother for my 30th birthday that I thought was beautiful. I love anything shabby chic and grey. Looks aren’t everything though especially when it comes to a dressing table. I had to move it against the wall so I could share a photo with you but it normally lies right in front of the window to maximize space and natural light for me to get ready at. 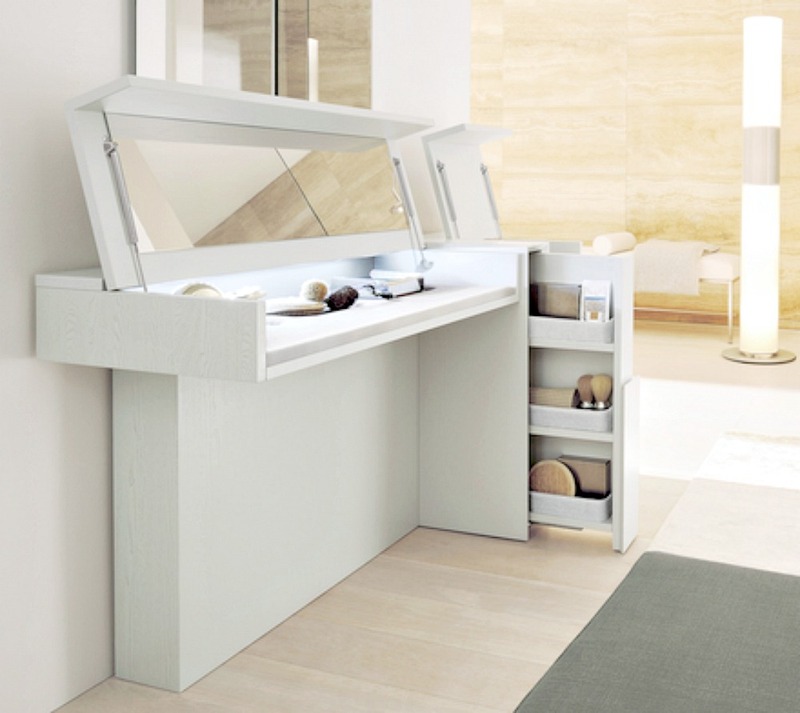 While it’s a lovely dressing table (I am so grateful to receive) it lacks storage and space. The shiny surface is extremely very hard to get makeup off of if you spill or your brushes are set down. Cleaner just takes the shiny surface off too so it’s no good for cleaning. At the moment, I have used an old jewellery box without the lid as my brush holder. I usually have beads at the bottom to hold them up better but my kids kept trying to eat them. I have been thinking lately I might paint it all white, but worried the shiny surface won’t hold the paint and I don’t really want to sand it all down. I would love bigger drawer space so I can have more of my stuff locked away safe from little fingers. And more table top space to put my hairspray, brushes, blow dryer on. At the moment they are a pile of mess underneath it that I don’t dare share with you. This dressing table works for me, for now, to get ready at and it holds sentimental value from my mother but if I was reviewing this I would say it doesn’t tick all the boxes. As you can see below I can barely get anything in or out of it already. I have been loving makeup more these days and my taste have blossomed into other brands and various makeup looks these days. I have shared my love for M&S beauty counter this week and my new found lust for Younique lashes too. It keeps bringing back to my dressing table and what I need to do to create more storage, and space for all my new purchases. For now, my dressing table area works for me and will do for some time but I do long for space and more storage and a surface that isn’t easily damaged by my use. This beautiful white wooden one below is ideal. You can hide all your blow dryers, curling irons, straighteners underneath the top and have all that storage for makeup and products at the side and still close it and have room for your perfumes and hairsprays on top! Now that’s what I call a good dressing table. Looks simple but provides you with all that you need! 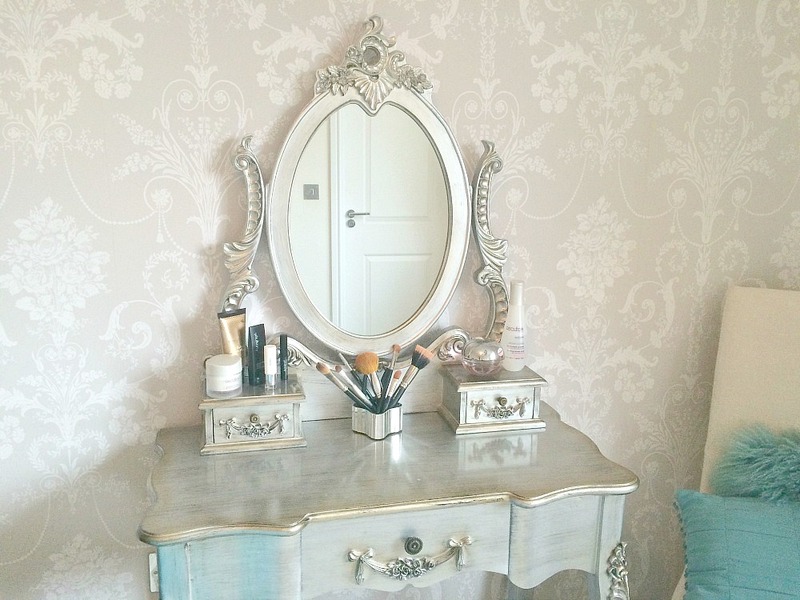 Check out other dressing table options I have found on Pinterest or follow my Dressing Table board below. 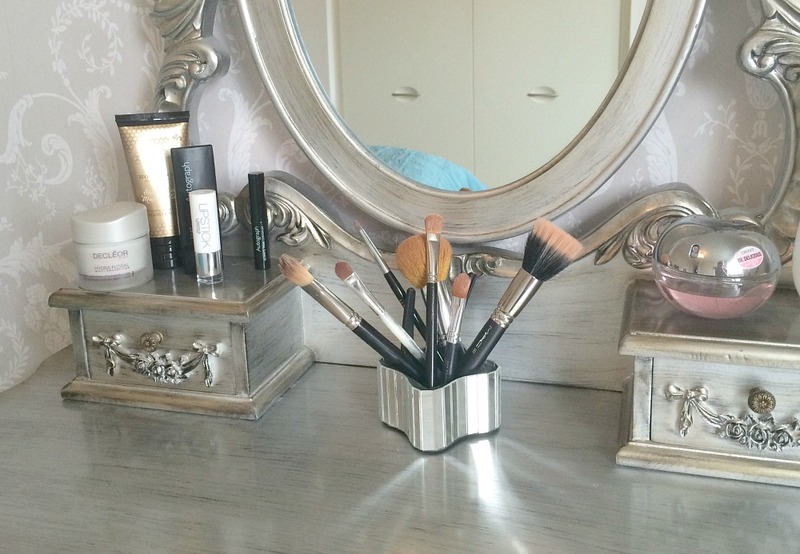 There are so many inspiring looks and ways you can set up your dressing table. It really is hard to just fall in love with one look or idea here. I have changed my mind about a trillion times already on what would work best for me and be comfortable and beautiful at the same time. Where do you get ready in your house? Do you have a dressing table? 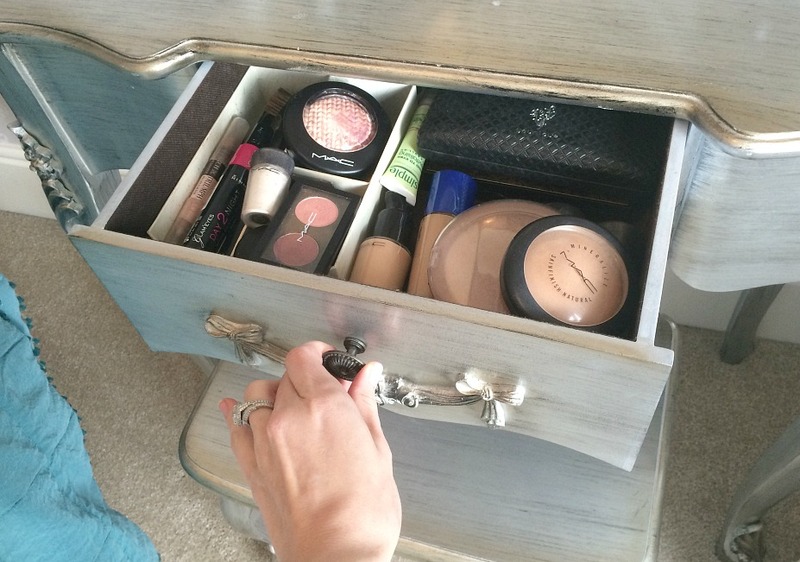 Would love to hear your storage solutions for makeup and beauty products below! Follow Let’s Talk Mommy’s board Dressing Tables on Pinterest. Oh dear. Hahaha it’s tough. I like the look of this one but there is no storage or space to actually get things done or store anything. There are a few I have my eye on at ikea though. Thanks for sahring! awesome dear! Thanks Emma. Yes I would love a big closet I could dance around for sure. Lol that would be heavenly. I can’t think of the name of it but maybe you can get a clear surface protector to stick on the top? Like the clear protector screen you put on your iPhone – oh I’ll try and remember the name! Oh what a great idea thank you. I will have to look out for it. Thank you so much. Thanks hunny. Me too. I don’t share with boys they are dirty!!! Lol hahaha I do love it just wish it was a little bigger for more storage and space. I really wanted the white one but I was so worried it would get all marked up and dirty. And my room had silver wallpaper so I thought it might stand out a bit more. Thanks hunny.